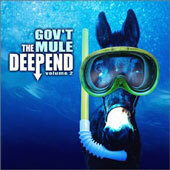 On this, the second of the deep end recordings, Gov’t Mule decides to create a musical fusion of many different genres and produce one of the must intriguing blues album to date. This second album features bass players including Les Claypool (Primus), Billy Cox (Jimi Hendrix), Phil Lesh (Grateful Dead), Tony Levin (Peter Gabriel, King Crimson), Meshell N’degeocello, Jason Newsted (ex-Metallica), and Chris Squire (Yes), among others. Each song is tailored toward the playing style of each guest bassist, while still holding the mellow/funk aspect that makes Gov’t Mule such a standout. Blues rock just doesn’t get any better. The guitar overflows with comforting southern blues riffs, sliding and twanging a musical scale of enormous territory. The songs come to life and provide a good excuse to broaden your musical tastes. Each song provides a new experience, whether it be from the Primus influenced Greasy Granny, or the gospel-esque “Hammer and Nails”, the songs capture different elements and mold them together into the most unique and incredible display of southern blues rock I have ever heard. Even if you have no interest whatsoever in blues/funk music, the quality and gathering of musicians is enough to make you a fan. Allen Woody should be very proud; his band/friends have created one of the best tribute albums of all time in his memory. Pick up The Deep End Vol. 1 and 2 as well as the dvd, there’s no reason not to own this piece of musical history.